A large part of the icebergs in the North Atlantic consists from about 100 iceberg-producing glaciers along the Greenland coast, while a few originate in the Eastern Canadian Arctic Islands. 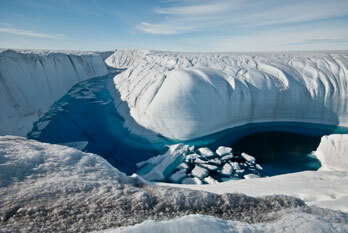 The glaciers of West Greenland are amongst the fastest moving in the world, up to 7km per year. 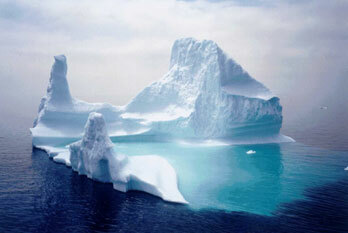 Icebergs are pieces of ice that formed on land and float in an ocean or lake. Icebergs come in all shapes and sizes, from ice-cube-sized chunks to ice islands the size of a small country. 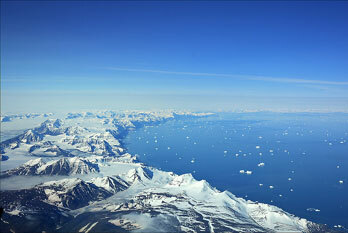 Approximately 40.000 medium to large sized icebergs calve, or break off, annually in Greenland. About 1 to 2% (400-800 pieces) of those make it as far south to arrive near Lewisporte, Newfoundland. The numbers vary greatly from year to year. 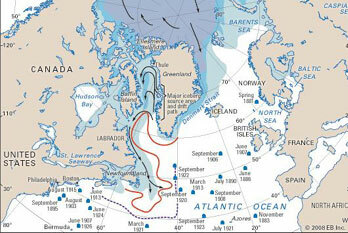 Before some icebergs completely deteriorate, they may travel many thousands of kilometres with ocean currents. Originating at around 75o north latitude in Baffin Bay, an iceberg may travel up to 4.000 km south to around 40o north latitude (800 km south of Lewisporte, Newfoundland). Extremely unusual sightings in Bermuda and Ireland have occurred well outside of this normal limit. 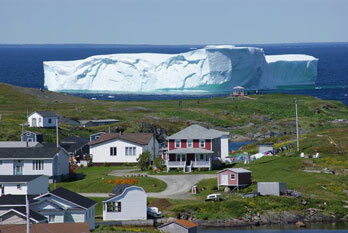 The average drift speed of icebergs off the north east coast of Newfoundland is around 0.7 kilometres per hour (kph). Iceberg drift speed is actually influenced by many factors including iceberg size and shape, currents, waves and wind. Speeds greater than 3.6 kph have been observed, as have stationary non-grounded bergs. Icebergs often take quite eccentric paths so that the distance travelled by a berg may be two or three times the strait line distance over a week or so. 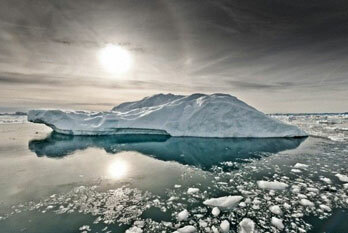 Icebergs are mostly white because the ice is full of tiny air bubbles. The bubble surfaces reflect white light giving the iceberg an overall white appearance. Ice that is bubble-free has a blue tint, which is due to the same light phenomenon that tints the sky. WHAT CAUSES THE COLOURED STREAKS IN ICEBERGS? The bluish streaks of clear, bubble-free ice often seen in icebergs result from the refreezing of melt water, which fills crevasses formed in the glacier as it creeps over land. The ice is blue because of the natural light-scattering characteristics of pure ice. Occasionally airborne dust or dirt eroded from land ends up on the glacier surface, eventually forming a noticeably darkened brown or black layer (in any orientation) within the ice of a floating iceberg. The ‘tip of the iceberg’ expression can be explained as follows: icebergs float because the density of ice (around 900 kg per cubic meter) is lower than that of seawater (around 1025 kg per cubic meter). The ratio of these densities tells us that 7/8 of the iceberg’s mass must be below water. 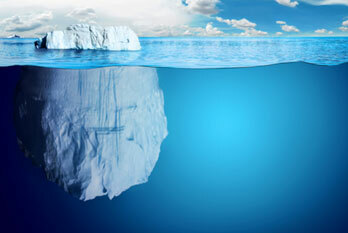 Usually icebergs protrude underwater so that they are 20 to 30% longer than they appear from above the surface. Also, the average depth (draught) of an iceberg is slightly less than its apparent length above water. Icebergs off the coast of Newfoundland and Labrador range in size from massive tabular and blocky bergs in excess of several million tonnes to small bergs weighing 1% of this. Categories of iceberg sizes, which are used for recording iceberg statistics, range from very large (greater than 10 million tonnes and hundreds of meters long) to large, medium and small bergs and on to ‘bergy bits’ then ‘growlers’, which are grand piano size pieces. Note that the average iceberg weight is one to two hundred thousand tonnes, and is about the size of a cubic 15-storey building. 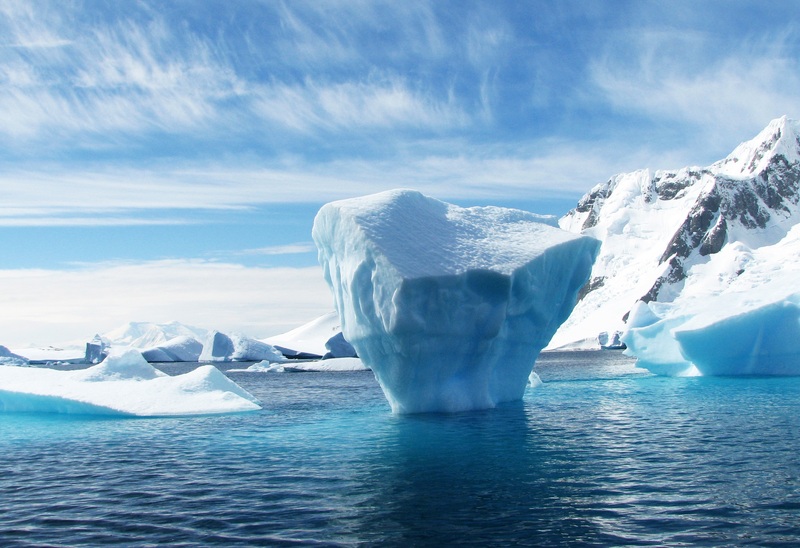 To be classified as an iceberg, the height of the ice must be greater than almost 5 meters above sea level and the thickness must be 30-50 meter. 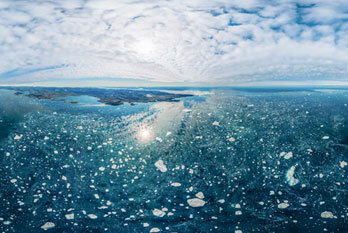 The smaller pieces of ice are known as ‘bergy bits’ and ‘growlers’. Bergy bits and growlers can originate from glaciers or shelf ice and may also be the result of a large iceberg that has broken up. A bergy bit is a medium to large fragment of ice. Growlers are smaller fragments of ice and are roughly the size of a truck or grand piano. 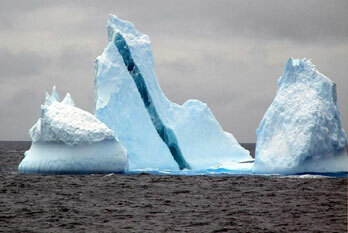 Icebergs are also classified by shape, most commonly being either tabular or non-tabular. Tabular icebergs have steep sides and a flat top. Non-tabular icebergs have different shapes, with domes and spires.